If you are planning your summer holiday, don't forget about the Loesje Summer Camp in Estonia from 22nd July til 02nd August 2011. A lot of people registered already from the Netherlands, Sweden, UK, Ukraine, Kazakhstan and Germany: Miranda, Clara, Artur, Meindert, Esther, Pascal, Lotte, Anara, Susanne, Kristin, Ganna, Oleg, Luder, Kateryna and Jonathan. Don't hesitate anymore, Loesje is a guarantee for fun! Please fill out the registration form and plan your journey to the marvelous Estonia. Looking forward to have an inspiring camp with you! A short video explaining the process of creating Loesje posters. Welcome to the Oddstream festival update of the Freedom of Speech wall. As you know, Loesje has a container full of cool activities for the visitors of the Oddstream festival in Nijmegen, Netherlands. Every now and then during the day we are giving you the latest in what people have expressed on the wall right here. Follow us! Getting to know the girl that represents creativity filled with optimism and includes critique that encourages people to (re)think what is inspiring. Becoming familiar with Loesje and her writing methods became an important discovery for Pina, an association for Culture and Education from Slovenia, that enriched organizational activities and strengthen the belief in power of collective work through creative, cultural methodology. We went to Berlin, read all Loesje publications, got to know the website of Loesje International, searched the poster archive for Slovenian posters and were meeting with former representatives. In February we were invited to a gymnasium to participate in the Cultural day. Loesje creative text writing workshop was one of twenty workshops among which pupils from 15 to 16 years old could choose from. The Loesje workshop was prepared for 22 pupils and lead by Vid, the president of PiNA and Kaja, the project leader at Pina. It was the first time Loesje methods were put into practice and the results are encouraging. For PiNA it became clear that creative writing methods are going to join other organizational methods. Tamara Sokolovič was introduced to PiNA as editor and she played an important role in explaining the final editing of the text proposals. The final editing was a learning process for us and we are looking forward to gain new knowledge and experiences in this field. In April we organized the youth exchange 'Minute of inclusion', a Loesje workshop was also part of it that served as an introduction to the topic and enabled participants to (self)reflect important social issues. The result of it was an exhibition of the created poems and posters. We may never truly know what the future will bring. But we will do our best and try to keep Loesje messages meaningful and visible. An article by Kulturlabor Trial&Error. During the vernissage and finissage we gave a personal interpretation on the Memefest theme through guerilla knitting by Semi Ramis, Litekultur with his interactive Loveboard and radical sounds. Highlight during the finissage was an off line demo and informative talk by Christian Zöllner from VR Urban, co-creator of the SMS slingshot –a catapult looking gadget that can shoot light messages. Memefest is an international festival of radical communication that nurtures and rewards innovative and socially responsive communication which exceeds market-orientated communication and works toward social social responsibility. Memefest is also an international network of people with different profiles - experts, activists, researchers, theoreticians and artists - who are interested in social change with a sophisticated use of media and communications. The effects of multi-annual networking at the global level are today seen through the work of independent centers with bases in Colombia, Brazil and Serbia. Established in Slovenia where also the main center is. In nine years the festival has become the world’s largest socially responsible communication festival, which directly contributes to critical writing and critical visual expression. driver, graphical designer, volunteers wanted! a driver (minimum 2 years driving experience, European driving licence) who would like to be one of the drivers of a van leaving Berlin on Saturday morning, 28th of May, to Nijmegen, the Netherlands (or jump off somewhere on the way, like Hannover, Osnabrück, Bad Bentheim). Loesje is going to the Oddstream festival http://www.oddstream.org/?lang=en and are one driver short. If you would like to drive there FOR FREE, mail rola@loesje.org. We are going back on the 7th of June, so it's optional to also want to drive along then. an experienced graphical designer, who wants to be part of the media team at the Oddstream festival, 29th of May-7th of June. Read more here:http://www.loesje.org/news/4217 But apply to rola@loesje.org asap if you are interested! volunteers for Loesje's open part at the Oddstream festival. If you would like to help out at Loesje's part of the participation area at the Oddstream festival, contact safaa@loesje.org. The volunteers will get free entry to the festival, food and a place at the camping area. This team is going to the festival on the 31st of May with Quer durch das Deutschland ticket (10-22 Euro's per person), and back on the 7th. If you want to join the festival as a visitor, but would like to travel there together with the Loesje crew, mail Safaa as well. Loesje International decided to share news and updates in a form different from the Bulletin to make the web site more interactive. Due to these plans we publish every month a review of the latest news, articles and updates of Loesje. 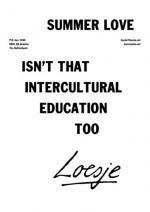 How to write creative Loesje posters? Upload your own article! If you have any texts around the subjects that Loesje deals with, or actions directly related to Loesje, please feel free to upload them yourself on the website! However, if you get stuck with technical problems, please send the text to us and she will do it for you. When did you fold a paper boat for the last time? Here's your chance to pick up on your old folding skills. In this pdf file you can find foldable Loesje boats. And they'd like to sail over your local fountain, park pound or rain pool. So they can make passers-by stand still, wonder and smile for a while. When you don't remember how exactly to fold a paper boat, here's the instructions for dummies. Make sure you fold the side with the Loesje texts inwards. The boats would appreciate some company of Loesje's water lilies. Cut them out and fold the leaves closed. As soon as you lay down the flower on the water, the leaves will unfold, like a real water lily, and show the message. In order to respect the environment, please take the paper boats and lilies out of the water at the end of the day. Please let us know the adventures of your boats and lilies by sending an e-mail. Please feel free to take pictures or movies and share them with Loesje through Facebook. Monica and I landed straight to the Board Meeting and Assembly of Loesje International, which was a very interesting experience for me. I got to know how big Loesje actually is and also learned a lot about how it works. After these first days, the weather got much better in Berlin and so did my tasks: for example editing the video of the Assembly happened to be like playing video games. I had an amazing time doing that. Actually I spent most of my time at Loesje editing videos (I did a trilogy ), so I barely could help Monica to translate Loesje posters and publications to Spanish. I guess, the only topic I’ve got left is the office and the people working there. I have nothing but compliments for them. The environment in the office is great and gets better any time Petra, Artur or anyone plays pranks on somebody. Finally, this article (also) comes to an end. I want to wish everyone Godspeed and I’d love to see them again as soon as possible. Our sunny experience finished on a rainy day. The Oddstream festival will take place between the 2nd and 5th of June in Nijmegen, the Netherlands, only 10 km from the German border. It will be an inspirational place to be for many reasons and it is close to Weeze airport where many cheap flights fly to and that makes it also accessible for international guests. One of the inspirations of Oddstream is the surrounding itself. The festival takes place in and around a former industrial factory, the Vasim, next to the river the Waal and you still see many industries around that gives it a bit raw and surrealistic atmosphere. During the four day festival Oddstream presents a program of music, interactive art, performance art, radical communication, film and more. On four stages over 100 acts will perform. During the day there is plenty of live music,film and interactive art activities and at night there is Club Oddstream for lovers of dance and electronic music. On the 3rd of June there is an ‘Inspiration Day for Art and Communication’ organized in collaboration with Memefest, festival for radical communication. Experts from around the globe will present their vision and views on communication, media and art. There's a festival camping for visitors of the festival. Visit www.oddstream.org to discover more. The Oddstream exhibition exists out of a selection of works of the winners of the Memefest friendly competition 2010/2011 and many media-art installations such as a 360ºpanorama medialab where artists are making film-productions that they will present at the festival, a sound sculpture that the visitors can control and adjust, light-art, art- performances, short film broadcast, VJ-shows in the night and a real robot. It is a mixture between inspirational, critical and playful art. Over 100 musicians, bands, sing and songwriters and VJ’s will come to Oddstream. The focus is mainly on independent indie, rock and electronical music. Oddstream gives space as well to local talents from Nijmegen, upcoming Dutch bands but also more known international artists such as Alec Empire, founder of the anarchistic band Atari Teenage Riot, DIY band like Chicks on Speed, Dissapears with Sonic Youth drummer Steve Shelley and the legendary postindustrial band ‘the Young Gods’ from Switzerland. Memefest and Oddstream present the world radical communicators on the 3rd of June 2011 in Nijmegen, the Netherlands. The Inspiration Day for Art and Communication is for everyone interested in art, communication and media. We expect to present, without modesty, world experts from Australia, Brasil, Canada and of course Europe to come as guest speakers for the Inspiration Day for Art and Communication. The confirmed speakers are; Sandy Kaltenborn,Tony Credland, Alain Bieber, Jason Grant, Shoaib Nabi and Paulo Hartmann. The inspiration Day for Art and Communication gives an added value to the Oddstream festival. In sea containers organizations like Loesje, Durftevragen wasstraat / Waarmakerij (Dare to ask),Casiophonic workshop, Grote Broer Kunsteducatie, presents workshops and activities that the festival visitors can engage in. During Oddstream, Memefest will organize a workshop on Socially Responsive Communication over several days. The winners of the Memefest friendly competition are invited for this workshop.The aim of this unique workshop experience will be to produce visual maps which will show the differences (and reasons for them) between Socially Responsive Communication and Social marketing. Oddstream’s international partners PINA, Mašta, Loesje International and INCA invited young people from Europe to be part of the Oddstream international press agency. They will be trained in critical thinking and how to make news-items. During Oddstream they will do the media-coverage and create every day an Oddstream journal that will be broadcasted on local TV, online and on the regional Newspapers website. Over 1.000 pupils from Nijmegen will visit the Oddstream exhibition the days before the festival is open for the public. They will see all the (interactive) art and many artists will be there to give some try-out workshops to the young people in filming, video-mapping and beat-creating. In between they can play in or with the media-art installations. Tickets can be bought online through: www.oddstream.org or at the festival itself. There is an Oddsteam festival day program and a night- program that has a separate ticket. Of course you can buy combination tickets and even an overall multi-day ticket. Beneath you find the prices of the single tickets. How to get to Oddstream? Nijmegen is located only 10 km from the German border in the East of the Netherlands. The closest airport to Nijmegen is Weeze-Düsseldorf airport in Germany. Ryanair flies to and from Weeze-Airport. When you book on time the costs to go to Oddstream will be low (for example from Italy Trieste or Treviso to Weeze costs only € 30, one way). The bus from Weeze-airport to Nijmegen costs € 16 and takes around 45 minutes. Another option is to fly on Eindhoven airport and from there take a train to Nijmegen. If you come from Germany there are many good train connections, just visit www.db.de . Oddstream is located around 5 minutes with taxi from Nijmegen railway station. There is a festival camping for Oddstream guests.